We had our first real snow storm today. They cancelled school before a single snow flake hit the ground. The automated call comes in a little before 6am and always gives me a flash back to snow days when I was growing up. Who remembers sitting by the radio waiting to hear your school district’s number? We never got a phone call and I can’t remember if the news had that little ticker thing along the bottom listing the school closings. I only remember sitting and listening to the radio. 767 is the number that comes to mind. I wonder if that’s right? We spent most of those snow days outside. There were open fields where houses now sit. I can remember kids riding snowmobiles, making their way through the fields to get to where the snow day “action” was. This “action” normally meant the place where everyone was standing around. Kids did a lot of standing back then. Once you got your driver’s license (woot! woot! ), you could drive around, only to stop the car and stand around with a group of kids. These days I can’t wait to just sit down. What does this have to do with soup? 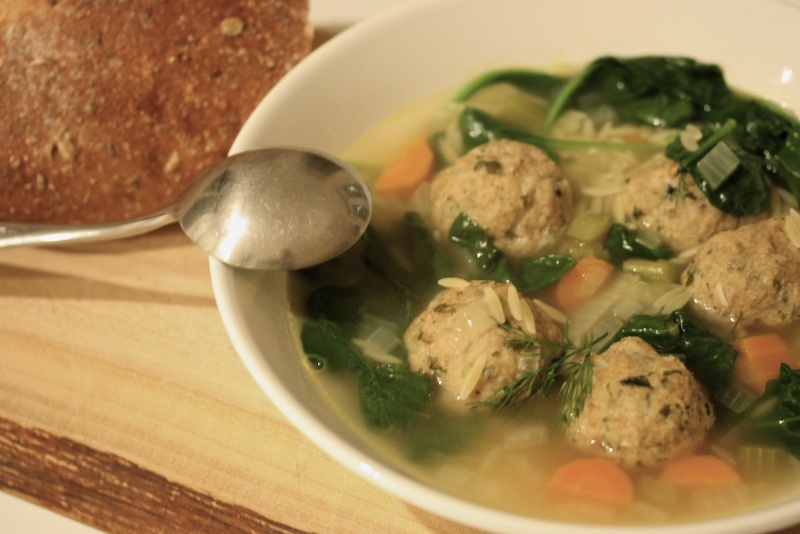 Nothing really, it’s just that when it snows I always feel like cooking, and a big bowl of this belly warming soup would be perfect on a day like today. Combine all the ingredients above in a large bowl. Line a sheet pan with parchment paper. 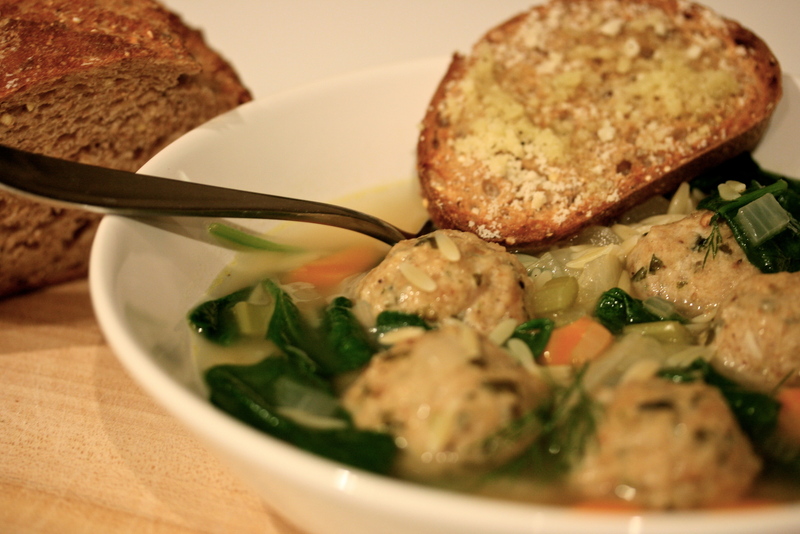 Make meatballs slightly smaller than a golf ball. 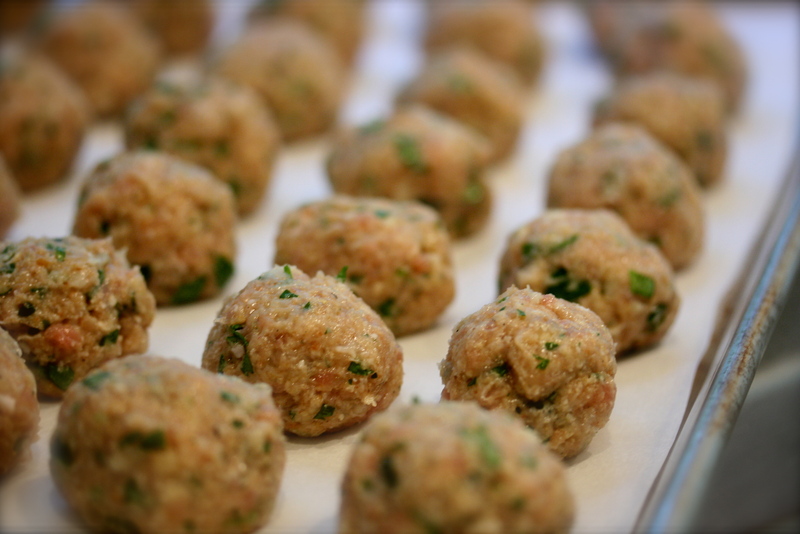 You should get somewhere around 30 meatballs depending on how big you make them. Bake in the preheated oven for about half an hour or until lightly browned. Remove from the oven and set aside. Heat a large dutch oven or soup pot over medium heat. Add the olive oil to the pan and sauté the onions, celery and carrots until they begin to soften. Season the vegetables with a little salt & pepper. 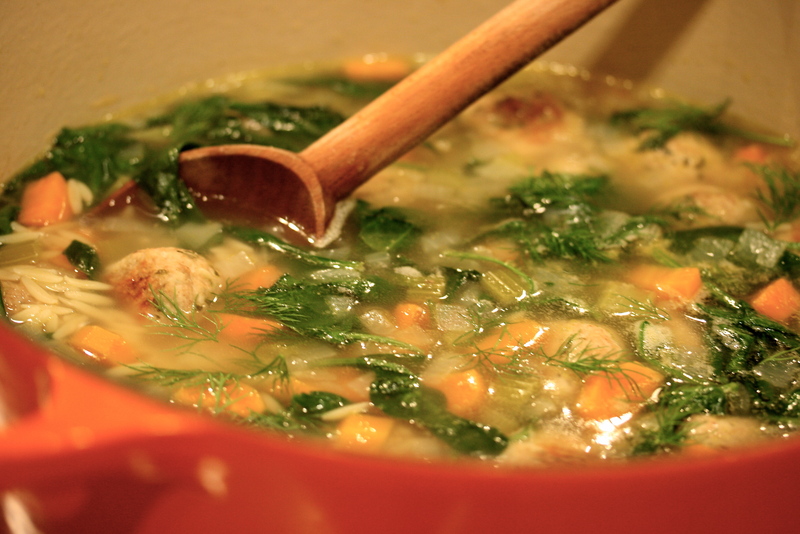 Add the chicken stock, wine and meatballs to the pot and allow the soup to simmer for about 15 minutes. Add the pasta and simmer until the pasta is al dente… check the pasta package for timing. Stir in the spinach and dill right before serving, spinach will wilt. Serve immediately with Parmesan toasts and extra grated cheese on the side. Preheat the oven to 400 degrees. Slice the bread into 1/2 inch thick slices and put on a foil lined sheet pan. Brush a little olive oil on the tops of each toast. Place in the preheated oven for about 6-8 minutes until crisp and a little golden. As soon as you remove the toasts from the oven, lightly rub the cut side of the garlic clove on the top of each slice and sprinkle with a little parmesan cheese. Serve on the side with the soup.